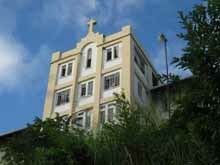 Welcome to our Mount St. Benedict Alumni Association of Trinidad & Tobago – Our Virtual Home on the Web. Sharing our journey with joy, caring for each other, and honoring those who serve us. This website is created and facilitated by Kazim Abasali on behalf of Ladislao Kertesz, Don Mitchell, Nigel Boos and the Abbey School Alumni Association who represent and serve us – ‘the Old Boys’. This is being done to honor those of us who have, and continue to keep alive the Alumni Association or ‘Old Boys’ fraternity all through the years. It is important that we recognize and thank those who gave so much in this regard. The reason why we are still here together is becase Ladislao Kertesz, through his circulars, that is emailed to us, the Old Boys group. Kindly email Ladislao if you want to be included and to receive the Circulars. Don Mitchell publishes Ladislao’s Circulars in the blog. Nigel Boos created our database, and being maintained by Kazim Abasali in Nigel’s honor. Arthur Knaggs did a Newsletter for the Abbey School: Mount Outside, and then the OASIS. And there was a website that is no longer in existence that was facilitated by Anthony “Gabby” Johnson. Special mention should be made of Jon Golding (RIP) for his tremendous work for his grand support to the Mount Saint Benedict Priests and the MSB Properties. He is one “Old Boy” who tried his best to keep our Mount dreams alive as it relates to our physical Mount Home. Our Past Alumni Secretary Christopher Knowles. (RIP).